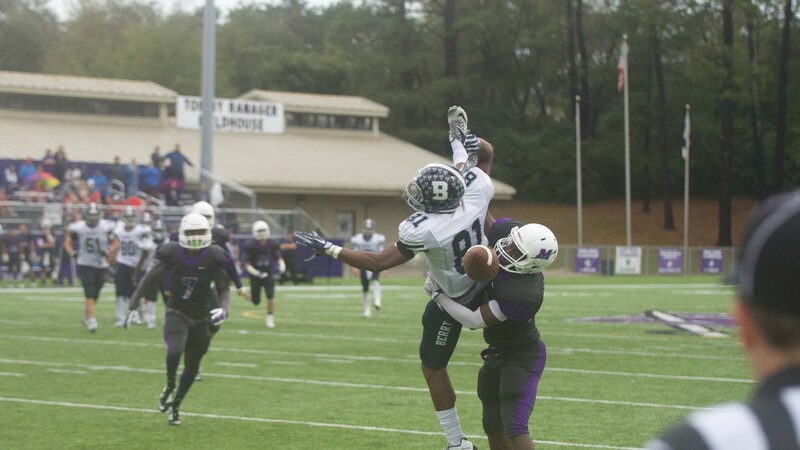 The rainy weather Saturday seemed to forecast the outcome for the Millsaps football team. With homecoming festivities in full swing, the Majors tried to continue the celebration. However, after a nearly two-hour weather delay, the Majors lost to the number-one team in the conference, Berry College, by a final score of 24-14. On Berry’s second possession of the game, the Vikings scored a touchdown as the lightning literally struck. The referees conversed and decided to delay the game. After almost two hours, the teams warmed up for a second time and the game resumed with Berry kicking the extra point. The second quarter belonged solely to the Majors as they scored two uncontested touchdowns. With 50 seconds left in the second quarter, Chance Clowers threw a 13-yard touchdown pass to Beau Wells and the extra point from Patrick McRaney evened the score at 7 all. The Majors got the ball back with 33 seconds left after a fumble recovery by Alex Foust. It took the Majors only three plays and 15 yards before Clowers threw another touchdown pass, this time to Rashad Sims. McRaney’s extra point increased the score to 14-7 in favor of the Majors at halftime. The Majors failed to score again after their dominating second quarter. Berry scored 10 points in the third quarter and increased its lead in the fourth quarter courtesy of an intercepted pass from Clowers.